Cops Give This Guy a Ridiculous Ticket. Some cops tend to issue ridiculous tickets to citizens for little things that usually would be fixed by just giving the person a courteous warning. The cops that do this are usually the most annoying ones that no person ever wants to have to deal with. Well Casey Neistat had to deal with a cop like this and he was issued a ticket for not riding in the bike lane by the NYPD. Neistat attested that not only is the ticket ridiculous because the bike lane is blocked sometimes, but also that a person directly in front of them was preforming a much worse moving violation. The officer didn’t care very much at all for what Neistat had to say. He said it didn’t matter and that he always had to be in the bike lane. 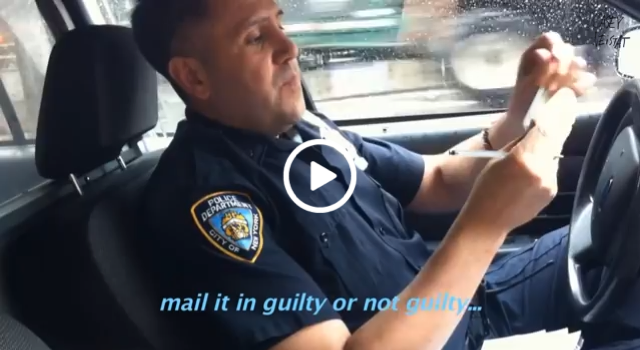 To prove his point Neistat made this awesome and funny video as a big FU to that cop and any other officer that would be willing to give a bicyclist a ticket for just trying to be safe. The video itself is very reminiscent of an old Jackass episode. Neistat rides in the bike lane throughout the video without turning out of it when obstacles are in his way. This clearly gets the attention of everyone around him and shows how dangerous bike lanes can actually be if the cyclist doesn’t drive aggressively and move out of the way of obstacles. They Introduced Their Lifeless Son To A Therapy Dog, What Happens Next Will Leave You In Tears!